Owner and auctioneer, Dave has over 20 years experience in the auction business. Beginning in 2013, Dave acquired full ownership of Rentzel's Auction service. Dave, his wife Aimee, son Noah, and daughter Gracie live in Mount Wolf, PA.
Dave is a 1992 graduate of York County Vo-Tech, a 1993 Graduate of Reperts School of Auctioneering in Decatur, IL, and a 1993 Graduate of HAAC's four -credit auctioneer course. In 1994 he was licensed and bonded as an auctioneer in PA. He has worked as an auctioneer for Rentzel's Auction Service since 1994, becoming a full-time auctioneer in August 2000. Previously Dave was employed at Mt. Royal Auction, Dover, PA from 1995-2001, Billet Industries from 1997-2000 and A.C.S. Tool from 1991-1997, where he worked as a machinist. Dave has served as central chapter director of the PAA (PA Auctioneers Association) and as vice-president. He is the 2007 State Bid-Calling Champion. He is a member of Community Bible Church, PAA, and Early American Steam Engine Association. His hobbies include collecting antique farm items and John Deere items. 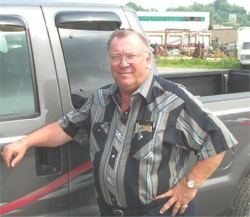 Blaine, has over 50 years experience in the auction business and decided to retire in 2012. Blaine and his wife Judy live in Manchester, Pa and has three children Gary Rentzel, Robin Shriver, and Nevin Rentzel, and 8 grandchildren. Blaine is a graduate of Northeastern high school and Reperts school of auctioneering in Decatur Ill.. He has served at different levels for the Pa. Auctioneers Association, including State President. Blaine has worked over the years at many Machinery consignment Auctions, Wayne Implement Auction, North Carolina, Diffenbachs Auction, New Holland, Pa, Wolgemouths Auction In Leola, Pa., and Marion Auction , Chambersburg, Pa. He was employed by York County Assessment Appeals Board from 1999-2002. Blaine has been on East Manchester Twp. Planning board since 1985. In 2007 Blaine was appointed as a Board Member on the PA Board of Auctioneers Examiners. Blaine is a Members of PA Auctioneers Assoc., National Auctioneers Assoc., The Lions Club, and Tall Cedars of Lebanon.